Nonprofits, companies, and government agencies unite to build communities by asking, What makes a good life? Like many older Americans, Janet Valentine embarked on a journey. Although she’d spent over two years in Florida since her husband had passed, she wanted to be closer to her three daughters, who all lived in Ohio. After having to sell the home she’d shared with her husband, she knew she faced a big decision. Valentine hadn’t lived in senior housing before, but she began to consider it. Often, seniors with modest incomes have to choose between three insufficient options: struggle with assisted living bills, navigate supportive services on their own, or rely on a loved one for caregiving. Joe Recchie, a Columbus, Ohio developer who frequently partnered with nonprofits, began noticing the need to provide older community members with better housing choices. He had already integrated community-based supportive services—such as after school programs and meals—into affordable family housing. In the early nineties, he began wondering if the same concept could be applied to housing for seniors. “There were no models,” Recchie said. So, he set out to create one. While Joe Recchie’s team began determining how to develop the community they envisioned, they realized they had to wrestle with a much more fundamental question: What makes a good life? Services for seniors would be dramatically different from those for families, but the approach to determining which services to pursue stayed the same. Service enrichment for seniors as he conceived it would not only enhance the lives of residents, but also the lives of their loved ones. Wellness centers, visiting nurses, and transportation to appointments allow seniors to age in place. In order to navigate healthcare options, residents require access to supports, such as case managers from their area agencies on aging. “Having a case manager helping a senior along with a loved one also gives some relief to that caregiver,” Recchie noted. He singled out the congregate meal site where residents enjoy daily, community lunches at no cost as perhaps the most important service, because it combines social interaction with nutritious meals. Additionally, residents need to be able to pursue their passions and hobbies in order to be intellectually stimulated and fulfilled. Facilitating a sense of belonging is also paramount. Intergenerational activities expand the boundaries of a community, and large, communal spaces ensure that residents can easily host family and friends. When the full range of human needs is taken into consideration, it becomes possible to create not simply housing but also community. In the past, some facilities charged seniors so much for services that the federal government established prohibitions preventing their inclusion for properties financed by the US Department of Housing and Urban Development (HUD). The goal was to stop exploitation, but restrictions also stymied efforts to establish new ways of providing fair and affordable housing. The team had to find a route around the roadblocks. Larke Recchie, Joe’s wife, who studied gerontology and is currently Executive Director of the Ohio Association of Area Agencies on Aging, compared housing capabilities with the service provision capabilities under state law. Joe Recchie then crafted housing that avoided federal prohibitions, met zoning and building code requirements, and included a congregate meal site, communal space, and recreational facilities. “Then, we had to structure the finances so we could afford to build all of the additional facility space while still meeting the affordability objective,” he said. In 1992, he got a chance to test the concept. Recchie’s Community Building Partners (formerly Concorde Capital Corporation) acted as development advisor for the Archdiocese of Cincinnati on the Twin Towers Place Apartments in Dayton, where, for the first time, he combined area services and affordable senior housing. “We took that prototype and started to replicate it,” he said. He began planning how he could take the model to his own Central Ohio community. Finding the right partner is crucial to the success of any project, but in the case of Newark’s Sharon Glyn Senior Apartments, there was one obvious candidate. Joe and Larke Recchie lived in Licking County, so they were already familiar with the work of the Licking County Aging Program (LCAP), which improves quality of life for seniors by supporting their health and independence. “They were an ideal partner,” Joe Recchie said. When he met with LCAP, it just so happened that there was a new executive director at the office, Dave Bibler. They were awarded a $500,000 tax credit loan from the Ohio Department of Development. “That allowed for the developers to keep the cost of the project down, so that they could keep the rent affordable for the seniors to move in,” Bibler said. LCAP is supported by a county levy and is a provider of PASSPORT, Ohio’s community-based Medicaid-waiver program that helps seniors age in place and avoid the costly move to nursing facilities. Eligible seniors meet with a case manager from the Central Ohio Area Agency on Aging, and LCAP provides personal care (such as help bathing and shaving), homemaking duties (such as dusting, vacuuming, washing dishes, and laundry), and meals. 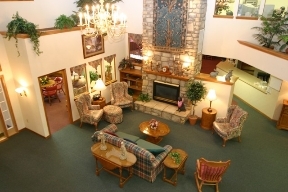 Some senior housing facilities prefer to provide services themselves. Bibler describes Sharon Glyn as a beautiful complex and notes that since it opened in 1999, it has consistently enjoyed a high occupancy rate. “If they have one or two openings, that’s a lot,” he said. Sharon Glyn has been successful enough that LCAP is considering the possibility of co-ownership, a first for them for an apartment complex. Sharon Glyn is made up of sixty one- and two-bedroom apartments. All sixty are reserved for low-income residents, and rent covers utilities. The facility also houses a library, hobby room, exercise room, coffee shop, and congregate dining room where residents meet for meals. One of those residents is Janet Valentine. She chose Sharon Glyn after moving to Ohio to be close to her daughters. Now, over six years later, not only is she active, but she’s also President of the Sharon Glyn Resident Council, which holds monthly meetings and plans special events and activities. She describes Sharon Glyn as a place where residents look out for one another and take special care to reach out to those without family left. 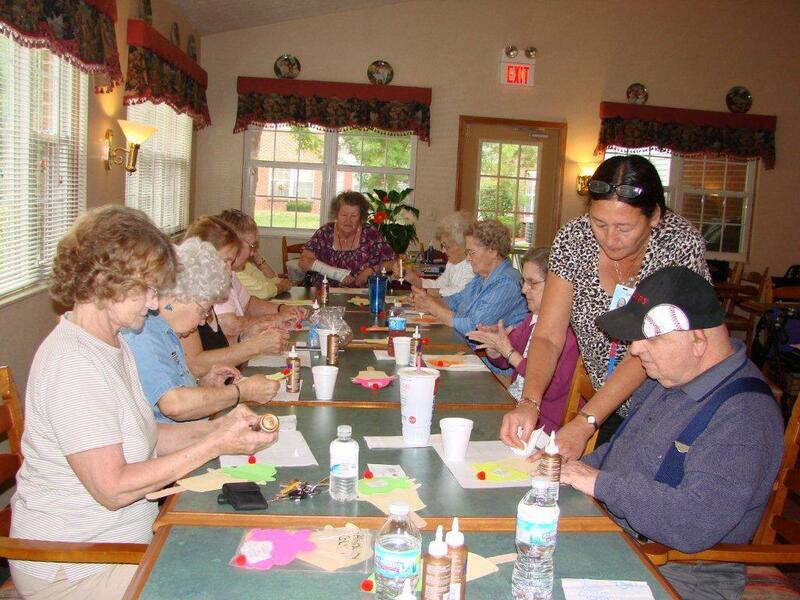 Community life includes euchre and domino groups, bingo, a walking club, monthly bookmobile visits, yard sales, bake sales, plus holiday and birthday parties. “It’s like a big, happy family,” Valentine said. In northeast Columbus, William A. Dodson, Jr. was visiting with Dr. Keith Troy, pastor of the New Salem Missionary Baptist Church. Troy told him that his father was retiring and struggling to find senior housing in the neighborhood. “His peers had moved to communities like Worthington to find such housing, away from their friends and churches,” Dodson said. As Executive Director of Dayspring Christian Community Development Corporation, a wholly-owned subsidiary of Rhema Christian Center, he understood the nuances of affordable housing. “The price point [for assisted living facilities] was out of reach for seniors with limited assets and retirement benefits,” he realized, yet “their incomes were above the HUD income limits.” He also felt that HUD housing lacked the space and amenities that seniors deserved. Meanwhile, Joe Recchie had decided he wanted to take on a new challenge with Corban-Commons Apartments. Dayspring was the natural place to start. Dodson and Recchie met when Dodson worked at the Ohio Department of Development and Recchie was finishing law school at the Ohio State University. “He helped our church with some legal advice and later helped me to develop Dayspring after I went into full-time ministry at the church,” Dodson said. Dayspring’s mission includes supporting affordable housing, and the nonprofit worked with Recchie to develop 1,000 homes in Central Ohio. “When I saw the quality of life at Sharon Glyn, I knew this was what I wanted for our seniors,” Dodson said. They soon started identifying other nonprofit partners. 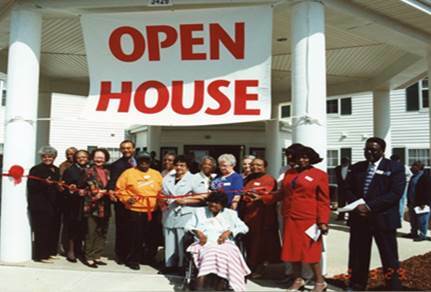 Recchie had worked with Homeport (formerly Columbus Housing Partnership) since its inception and had developed 1,100 homes with them across Columbus, but he knew they had yet to work on senior housing. They jumped at the opportunity. Next, two groups connected to local churches signed on as co-sponsors, Mount Hermon Missionary Baptist Church’s My Brother’s Keeper and New Salem Missionary Baptist Church’s Renaissance Development Corporation. 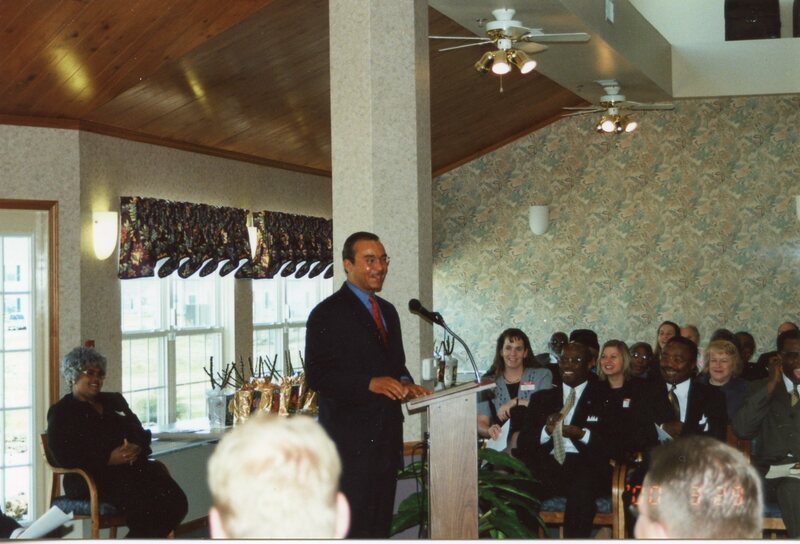 Recchie had long enjoyed working with nonprofit community groups. The team gathered funding through a combination of grants (including one from the Robert Wood Johnson Foundation to study the health of caregivers), Low-Income Housing Tax Credits, matching funds, corporate donations, and partnerships with Fifth Third Bank Corporation, the Ohio Department of Development, the Federal Home Loan Bank, and the City of Columbus. “The service enrichment model and the use of the Low-Income Housing Tax Credits program allowed us to provide a quasi-assisted living community, which affirms the dignity of our seniors,” Dodson explained. Once again, a senior service levy boosted the project’s viability, as did having access to PASSPORT providers. The primary service provider is LifeCare Alliance, which was formed over a century ago, and the Central Ohio Area Agency on Aging coordinates PASSPORT. On March 29, 2000, Corban-Commons opened its doors. At the Open House, a large group gathered to celebrate and welcome Mayor Michael Coleman, who spoke at the event and congratulated the team. Corban-Commons is located on 6.7 acres and is made up of 90 one- and two-bedroom apartments, 72 of which are reserved as low-income units. The facility also has community space, a computer lab, beauty shop, patio, pond, fitness center, and medical exam room, and it also hosts LifeCare Alliance’s “Eat Better, Feel Better” classes. 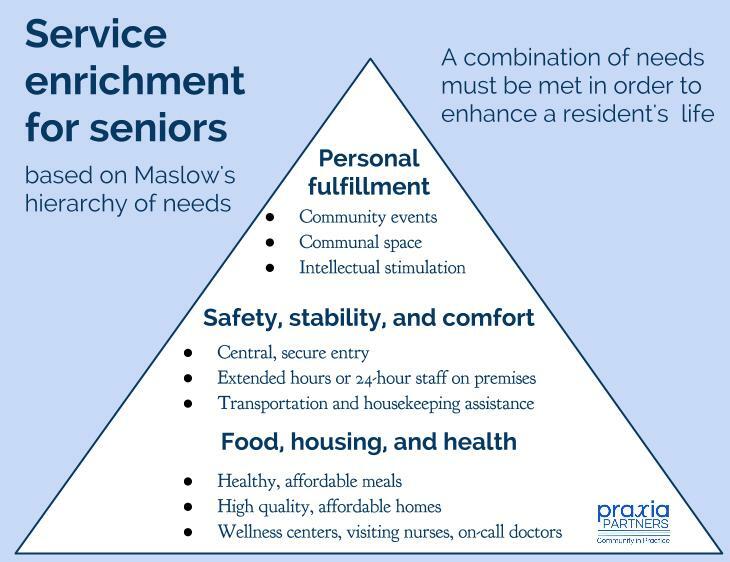 Twenty years since Joe Recchie first tested his model of combining supportive services with affordable senior housing, and over ten years since Sharon Glyn and Corban-Commons opened, the need for service enrichment is growing. In fact, according to the Census Bureau, the population of Americans 65 or older will double by 2030. “The senior population is going to continue to grow, so the need for all our services will grow, including the service enrichment aspect within complexes such as Sharon Glyn,” Dave Bibler, of LCAP, predicted. Central Ohio has taken note of their example. “Homeport, National Church Residences, and the Columbus Metropolitan Housing Authority have emulated the model throughout Columbus and Franklin County,” Dodson explained. He believes the model has implications beyond family and senior housing, especially for veterans and people with physical disabilities. Expanding service enrichment to new populations requires strong working relationships. “Our best partnerships have been based on trust and excellence. In working with Joe [Recchie], that has always been the case,” Dodson commented. For his part, Recchie values the three decades he’s worked with Dayspring and admires both the organization and Dodson, describing him as selfless and creative. For LCAP and Bibler, the most important objective for senior housing is fostering independence. For Dayspring and Dodson, it’s upholding dignity. For Recchie, it’s creating community. Although the path to developing service-enriched, affordable housing for seniors was complex, the result is strikingly simple: a place to call home. Sharon Glyn resident Janet Valentine took a moment to reflect on her own journey and what the community means to her. “I have found it to be the answer to a prayer,” she said.